Edited 1 time(s). Last edit at 07/02/2016 05:50AM by DjDemonD. Have you noticed, if you move the Y-Slide all the way to the back the teeth on the belts start to line up. I'm wondering about redesigning the pulleys to offset one outside and one inside to stop the teeth from lining up. It's not a huge deal on the 200x200 ALU design, but increasing the size of the aluminum starts to notice this more and more. I've also had to redesign the y-slide brackets to shift the bearing bolt holes to the underneath as I've started to notice the screw heads and nuts are rubbing on the side of the aluminum. I notice that the belts do get close to one another but my y-dimension is sill for a 200mm build area, I have enlarged x to 280mm but this doesn't worsen this problem. Offsetting the pulleys seems sensible. I don't actually have my Y slide bearing bolts attached the bearings are quite snug. But yes having them on the bottom does make sense. I've worked out this as an option for the left. The right would be similar, but the pulleys would be swapped. I'll have to print these and give them a shot sometime, but it does require a longer spacer for the gap offset by not having the stacked pulleys. I am just not sure of the thickness of the plastic right after the aluminum extrusion to be sure if its strong enough for the belt tensions. And it would only use a nut on the right pulley for holding the rod tight. The left pulley would only use a M8 bolt as a shaft without any sort of nut attachment. Edited 2 time(s). Last edit at 07/11/2016 02:01PM by PDBeal. Be interested to see how this works, maybe make the packaging easier and use smaller bearings? I've printed and fitted it onto my Smartrapcore Alu, and it works pretty well. Pictures and details are on thingiverse.com and on Onshape. I can't say for certain, but I've noticed a lot less ringing on my parts since this was added, but that could be due to the fact I lubed everything when I put it all back together. The belts not changing planes does change the forces on the bearings and GT2 drive pulleys, so it could be a bit of both and the existing belts fit. Edited 1 time(s). Last edit at 07/18/2016 10:17AM by PDBeal. Great results! Will download and try it myself as soon as I get chance. I've linked to your design from the version I did. 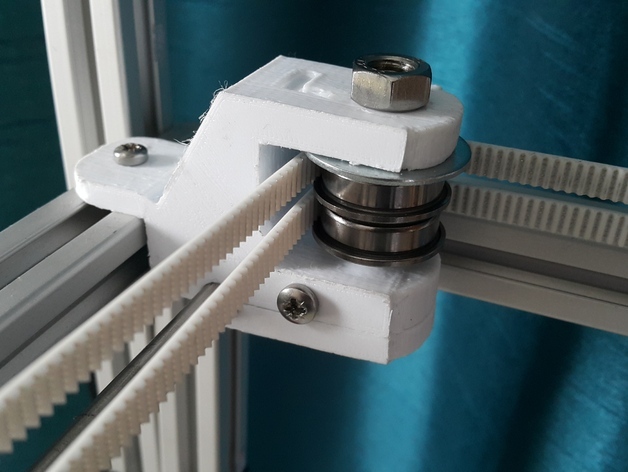 This might be a stretch but I wonder if there is a way we can incorporate a differential tensioning mechanism into one of the pulley holders to help with x/y dimension tuning. I've seen it done on the motor mounts but this doesn't work for the Smartrapcore as the motor mount is the y rod holder. The balanced tension carriage seems to be useful but I've still had to pull one belt 3 teeth tighter than the other despite cutting the two belts tooth for tooth the exact same length to eliminate parts being 2% too small in X but exactly correct in Y.
Edited 3 time(s). Last edit at 07/18/2016 11:33AM by DjDemonD. Edited 1 time(s). Last edit at 07/30/2016 07:20AM by CeledaBcn. I've been thinking about the tensioning and the only realistic option I think will work, would be to decouple the y rod holders from the motor mounts. Mount the motors with sliding fixings and use the motor mount as the adjustable tensioner, which would probably mean upside down motors certainly on one side as the pulley is below the frame. Not as neat but very effective.